Admission to UG & PG for Session 2018-19 have been closed. This is in continuation of our earlier notice regarding admission in M.Sc. courses in Chemistry, Microbiology and Zoology. 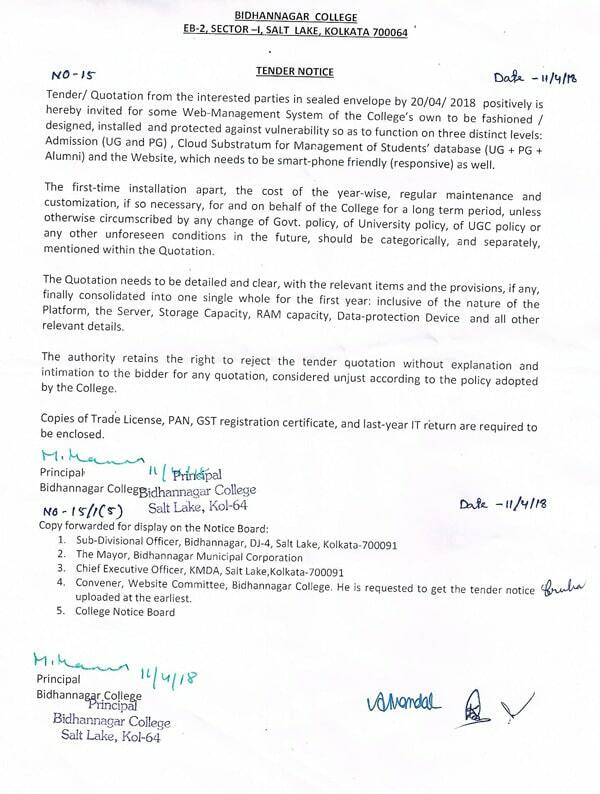 Degree Certificates up to 2016 will be distributed from Students' Section on every Monday, Wednesday and Friday between 2 pm and 4pm on production of original Part III marksheet. Inportant information about Coronery Stents and importance of Yoga that should be posted on college websites. Tender Notice for Security Personnel & House Keeping Staff. Sealed quotations are invited from the reputed Security Agencies for the year 2018-19. Quotations are inivited in sealed envelopes from reputed Printing Houses for printing of Prospectus (600 copies approximately). 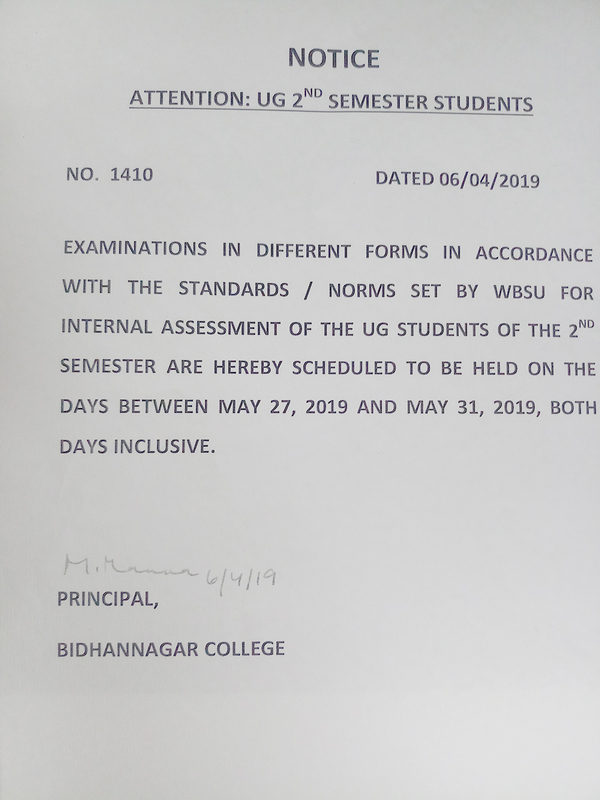 Opening of tenders at the Department of Physics of Bidhannagar college on 23rd April, 2018 (Monday) at 12:30 p.m. 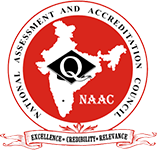 Sealed quotations are invited for Online College Admission System (UG, PG) as well as Student Data Management & College Website. We have Professors who don't simply teach, but also guide you in your quest of knowledge. BNC has well-stocked libraries with text books, reference books, e-books, periodicals and digital assets. R&D is an integral part of the ethos of our college and we believe its our responsibility to promote it. Once a student at BNC, you will be forever part of our family and we will support you through thick and thin. Kaushik Patra, Animesh Sau and Parthapratim Dey, students of Department of Chemistry, have won FIRST PRIZE at the prestigious 22nd CHEMIQUIZ, organized by Presidency University, Kolkata in January 2018. 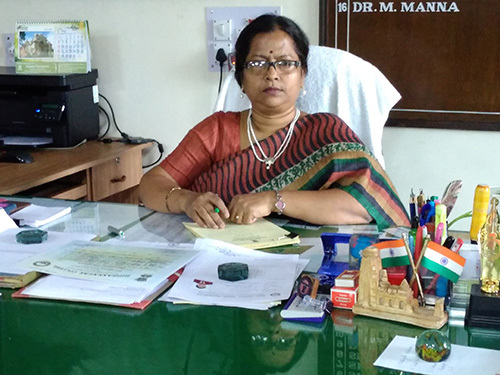 Bidhannagar College has been affiliated to the West Bengal State University, Barasat since 2008. Bidhannagar College has been re-accredited with Grade B+ in the 2nd Cycle in 2017.